The Bayesian Wavelet Extractor only runs on Linux. Attempting to run it on Windows will produce an error message (WavX will not run on Windows). At the tab header, click the Add icon and select New Wavelet Extractor (Bayesian). 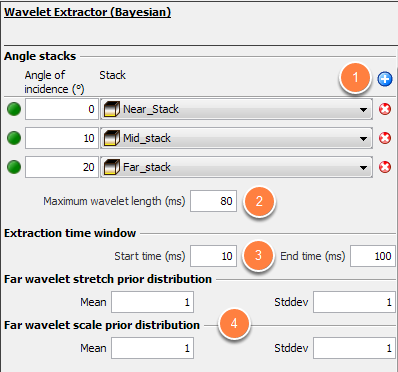 In the Details Panel of the new Bayesian Wavelet Extractor, click the Add icon beside Angle stacks to select at least one Stack volume and define the Angle of Incidence (°) to be used for the extraction process. All stack angles must be unique. Define the Maximum wavelet length (ms) to be applied to all wavelets. In the Extraction time window section, type the Start time (ms) and End time (ms) for the extraction. If multiple stack volumes are provided, define the mean and standard deviation of the Far wavelet stretch prior distribution and Far wavelet scale prior distribution. In the Wells section, click the Add icon to provide at least one well for the extraction process. If you have provided any stacks with non-zero angle, you must select all three curves for P Slowness, S Slowness and Density. If you choose one stack with an angle of 0°, the S slowness curve is not required. At Well position prior distribution, define the X/Y shift mean and standard deviation for the wells. If multiple wells were selected, click on the Per well check box to define a different X/Y mean and standard deviation for each well. Similarly, define the Time shift mean (ms) and standard deviation for the wells. 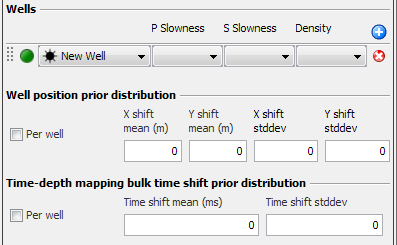 If multiple wells were selected, click on the Per well check box to define a different time shift mean and standard deviation for each well. In the Switches section, select the Use a wavelet prior check box if you want the calculations to begin from a selected prior. If a wavelet prior is used, Insight will automatically compute only the longest possible wavelet. Specify the percentage of Uncertainty (stddev) for the wavelet prior, and choose whether to apply it to the Max Sample or Each Sample. 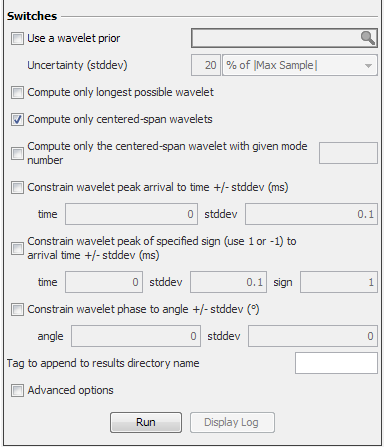 Constrain the wavelet peak arrival time and standard deviation by selecting the Constrain wavelet peak arrival to time +/- stddev (ms) check box. Specify the time and stddev in the boxes below. Hover over a particular box to identify the range of the value that can be inserted. To constrain the wavelet peak of a specific sign, tick the Constrain wavelet peak of specified sign to arrival time +/- stddev (ms) check box. Specify the time, stddev and sign in the boxes below. The value of the sign must be 1 or -1. Constrain the wavelet phase to an angle with a standard deviation by selecting the Constrain wavelet phase to angle +/- stddev (°) check box. Specify the angle and stddev in the boxes below. At Tag to append to results directory name, type a name for the tag to add to the results directory. Click Run to run the process. Note: This process only runs on Linux and MacOS X. An error will appear if you try to run it on Windows. Once the process completes, a new wavelet item will be available in the Wavelet tree.